Model train bridges are a very important element of most layouts. They are obviously useful serving to get trains from one place to another and to allow roads to pass underneath unobstructed by the passing of frequent trains. However, they also add to the décor, history and romance of the railroad. Before 1840 most bridges in this country were relatively weak wood or masonry structures. 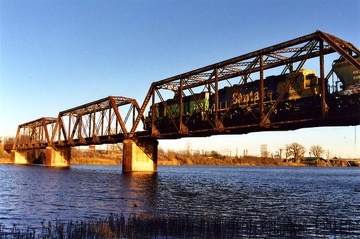 After the advent of the railroad, engineers were forced to make much stronger bridges because of the heavy equipment that they were required to accommodate. Wood was mostly used through the 1870’s. After that, wood gave way to iron and steel, which then led to arches and cantilevers. In the 1890’s we started seeing lift drawbridges. Around the same time, concrete, instead of stone, started being used for abutments and pier supports. In the 1930’s rivet use changed to bolts and by the 1950’s, the steel construction was mostly welded. “E” numbers are used to indicate how much of a load each locomotive axle can support. E-30 would indicate light service with a load capacity of 30,000 pounds per axle. E-60 load capacity was common in the 1920’s. An E-70 bridge should be able to support 70,000 pounds per axle required for modern mainline service at high speed. •	Deck bridges are those with the supporting structure (girders or trusses) located below the track, so you can easily see the trains crossing the structure. •	Through bridges have the supporting structure above the track. •	Beams, Girders and Trusses are the different supporting elements used for a deck or through bridge. Beams are usually 12-36” in depth, girders are 36 -170”, and trusses are over 170”. •	A Trestle refers to a bridge consisting of several short spans of track that are supported along the length by “trestles” (pilings, or bents) of timber or steel. If the “trestle “ is made of stone, it is usually called a viaduct. •	Arch bridges are used for covering large distances. It requires strong supports at each end and the progressively smaller strutted supports curve upward to the middle creating an arch. •	A Continuous truss bridge. can also cover long distances using single long truss supported by multiple piers. If the continuous bridge has only one pier support in the middle, it’s called a 2-span bridge. If it has 2 piers, it’s called a 3-span bridge and so on. •	A Cantilever bridge. is basically 2 halves of a bridge with each half having only one center support, and the 2 bridge sections connected in the middle and hinged in such a way as to avoid transfer of stresses from one side to the other. •	Suspension Bridges can span several thousand feet using a series of cables running over 2 towers with the floor of the bridge hanging from the main wire cables by suspender cables. There are 2 types of track flooring for that can be used for your model train bridges. One type is to use the conventional wood ties attached to the bridge structure and the rails are then nailed to the wood ties. The second type is to have a flat trough on which the ties are laid and the tracks are then attached to the ties and ballasted. Ballasted floors are smoother and quieter and can be often found on beam and plate girder decks. Most bridges have guardrails extending through the bridge on the inside of the regular rails to keep the wheels in line and prevent derailments on the bridge. They usually extend any where from 20 to 60 feet on each side of the bridge. Bridge girders are always straight and never curved. If you want your girder model train bridge to curve, you will have to use straight sections of the girders and connect them at angles to form the “curve”. The track itself within the girders of course will have to be curved; but if the girders are located above the track, they will have to be wide enough apart to provide the clearance needed for your cars to round the curve without scraping on the girders. There are many model train bridge kits available that you can use to build almost any kind of bridge that you wish. Try to match the type of bridge you want to model with the proper era and locale in which those bridges prototypically appeared. Many bridges are constructed using a combination of the above types. 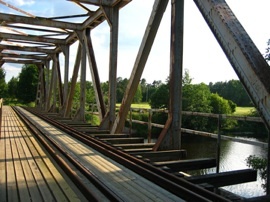 For example, you may see a deck truss structure in the center of a timber trestle bridge. Look for photos of different bridges on the Internet and in model railroad catalogs. See what appeals to you and what would be appropriate for the place on your layout where you would like to put it. Painting and weathering your model railroad bridges will add realism and character to your layout. If you want to try your hand at scratchbuilding your model train bridge, there are various books and articles that have been written about this. One of my favorite reference books on this subject is The Model Railroader's Guide to Bridges, Trestles & Tunnels by Jeff Wilson. For a look at some HO and G scale bridges -> www.choochoostuff.com - Manufacturer and supplier of several styles of G scale steel bridges and brass bridges. Also track accessories such as Track Cleaner, Dual track bender, track inclinometer, code 332 track joiners etc. From "Model Train Bridges" to "Model Train Scenery"
From "Model Train Bridges" to "Homepage"